This article is about sphinxes in general. For the great sphinx statue at Giza, see Great Sphinx of Giza. For other uses, see Sphinx (disambiguation). A sphinx (Ancient Greek: Σφίγξ [spʰíŋks], Boeotian: Φίξ [pʰíːks], plural sphinxes or sphinges) is a mythical creature with the head of a human and the body of a lion. In Greek tradition, the sphinx has the head of a human, the haunches of a lion, and sometimes the wings of a bird. It is mythicised as treacherous and merciless. Those who cannot answer its riddle suffer a fate typical in such mythological stories, as they are killed and eaten by this ravenous monster. This deadly version of a sphinx appears in the myth and drama of Oedipus. Unlike the Greek sphinx, which was a woman, the Egyptian sphinx is typically shown as a man (an androsphinx (Ancient Greek: Ανδρόσφιγξ)). In addition, the Egyptian sphinx was viewed as benevolent, but having a ferocious strength similar to the malevolent Greek version and both were thought of as guardians often flanking the entrances to temples. In European decorative art, the sphinx enjoyed a major revival during the Renaissance. Later, the sphinx image, something very similar to the original Ancient Egyptian concept, was exported into many other cultures, albeit often interpreted quite differently, due to translations of descriptions of the originals and the evolution of the concept in relation to other cultural traditions. The largest and most famous sphinx is the Great Sphinx of Giza, situated on the Giza Plateau adjacent to the Great Pyramids of Giza on the west bank of the Nile River and facing east (29°58′31″N 31°08′15″E﻿ / ﻿29.97528°N 31.13750°E﻿ / 29.97528; 31.13750). The sphinx is located southeast of the pyramids. Although the date of its construction is uncertain, the head of the Great Sphinx is mainly believed to bear the likeness of the pharaoh Khafra, while late 20th century geologists have argued that water erosion in and around the Sphinx enclosure proves the Sphinx predates Khafra, a claim that is sometimes referred to as the Sphinx water erosion hypothesis. What names their builders gave to these statues is not known. At the Great Sphinx site, a 1400 B.C. inscription on a stele belonging to the 18th dynasty pharaoh Thutmose IV lists the names of three aspects of the local sun deity of that period, Khepera–Rê–Atum. Many pharaohs had their heads carved atop the guardian statues for their tombs to show their close relationship with the powerful solar deity Sekhmet, a lioness. 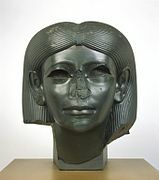 Besides the Great Sphinx, other famous Egyptian sphinxes include one bearing the head of the pharaoh Hatshepsut, with her likeness carved in granite, which is now in the Metropolitan Museum of Art in New York, and the alabaster sphinx of Memphis, Memphis, Egypt, currently located within the open-air museum at that site. The theme was expanded to form great avenues of guardian sphinxes lining the approaches to tombs and temples as well as serving as details atop the posts of flights of stairs to very grand complexes. Nine hundred sphinxes with ram heads, representing Amon, were built in Thebes, where his cult was strongest. In the Bronze Age, the Hellenes had trade and cultural contacts with Egypt. Before the time that Alexander the Great occupied Egypt, the Greek name, sphinx, was already applied to these statues. The historians and geographers of Greece wrote extensively about Egyptian culture. Herodotus called the ram-headed sphinxes Criosphinxes and called the hawk-headed ones Hieracosphinxes. In Greek mythology, a sphinx is represented as a monster with a head of a woman, the body of a lioness, the wings of an eagle, and a serpent-headed tail. The word sphinx comes from the Greek Σφίγξ, apparently from the verb σφίγγω (sphíngō), meaning "to squeeze", "to tighten up". This name may be derived from the fact that, in a pride of lions, the hunters are the lionesses, and kill their prey by strangulation, biting the throat of prey and holding them down until they die. However, the historian Susan Wise Bauer suggests that the word "sphinx" was instead a Greek corruption of the Egyptian name "shesepankh", which meant "living image", and referred rather to the statue of the sphinx, which was carved out of "living rock" (rock that was present at the construction site, not harvested and brought from another location), than to the beast itself. There was a single sphinx in Greek mythology, a unique demon of destruction and bad luck. According to Hesiod, she was a daughter of Orthrus and either Echidna or the Chimera, or perhaps even Ceto; according to others, she was a daughter of Echidna and Typhon. All of these are chthonic figures from the earliest of Greek myths, before the Olympians ruled the Greek pantheon. The Sphinx is called Phix (Φίξ) by Hesiod in line 326 of the Theogony, the proper name for the Sphinx noted by Pierre Grimal's The Penguin Dictionary of Classical Mythology. The sphinx was the emblem of the ancient city-state of Chios, and appeared on seals and the obverse side of coins from the 6th century B.C. until the 3rd century CE. "Riddle of the Sphinx" redirects here. For other uses, see Riddle of the Sphinx (disambiguation). The Sphinx is said to have guarded the entrance to the Greek city of Thebes, asking a riddle to travellers to allow them passage. The exact riddle asked by the Sphinx was not specified by early tellers of the myth, and was not standardized as the one given below until late in Greek history. The Sphinx of Naxos, on its 12.5 meters Ionic column, Delphi, 560 B.C. (reconstitution). 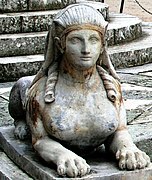 It was said in late lore that Hera or Ares sent the Sphinx from her Aethiopian homeland (the Greeks always remembered the foreign origin of the Sphinx) to Thebes in Greece where she asked all passersby the most famous riddle in history: "Which creature has one voice and yet becomes four-footed and two-footed and three-footed?" She strangled and devoured anyone who could not answer. Oedipus solved the riddle by answering: "Man—who crawls on all fours as a baby, then walks on two feet as an adult, and then uses a walking stick in old age". By some accounts (but much more rarely), there was a second riddle: "There are two sisters: one gives birth to the other and she, in turn, gives birth to the first. Who are the two sisters?" The answer is "day and night" (both words—ἡμέρα and νύξ, respectively—are feminine in Ancient Greek). This second riddle is also found in a Gascon version of the myth and could be very ancient. Bested at last, the Sphinx then threw herself from her high rock and died. An alternative version tells that she devoured herself. In both cases, Oedipus can therefore be recognized as a "liminal" or threshold figure, helping effect the transition between the old religious practices, represented by the death of the Sphinx, and the rise of the new, Olympian gods. In Jean Cocteau's retelling of the Oedipus legend, The Infernal Machine, the Sphinx tells Oedipus the answer to the riddle in order to kill herself so that she did not have to kill anymore, and also to make him love her. He leaves without ever thanking her for giving him the answer to the riddle. The scene ends when the Sphinx and Anubis ascend back to the heavens. There are mythic, anthropological, psychoanalytic and parodic interpretations of the Riddle of the Sphinx, and of Oedipus's answer to it. Sigmund Freud describes "the question of where babies come from" as a riddle of the Sphinx. 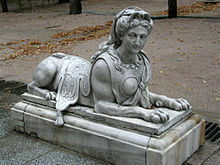 Numerous riddle books use the Sphinx in their title or illustrations. Sphinx is indeed reported to have had many Riddles, but this offered to Oedipus was the chief, "What is that which in the morning goeth upon four feet; upon two feet in the afternoon; and in the Evening upon three?" What was answered by Oedipus is not known. But they who interpret concerning the Ages of Man are deceived. For a Quadrangle of Four Elements are of all things first to be considered, from thence we come to the Hemisphere having two lines, a Right and a Curve, that is, to the White Luna; from thence to the Triangle which consists of Body, Soul and Spirit, or Sol, Luna and Mercury. Hence Rhasis in his Epistles, "The Stone," says he, "is a Triangle in its essence, a Quadrangle in its quality." Funerary stele, 530 BCE, Greece. Limestone funerary stele (shaft) surmounted by two sphinxes Greece 5th century BCE. Marble capital and finial in the form of a sphinx, 530 B.C. Buddhist sphinx on a stupa gateway, Bharhut, 1st century B.C. 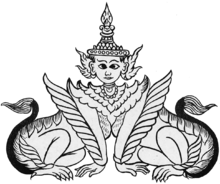 A composite mythological being with the body of a lion and the head of a human being is present in the traditions, mythology and art of South and Southeast Asia. Variously known as purushamriga (Sanskrit, "man-beast"), purushamirugam (Tamil, "man-beast"), naravirala (Sanskrit, "man-cat") in India, or as nara-simha (Sanskrit, "man-lion") in Sri Lanka, manusiha or manuthiha (Pali, "man-lion") in Myanmar, and norasingh (from Pali, "man-lion", a variation of the Sanskrit "nara-simha") or thep norasingh ("man-lion deity"), or nora nair in Thailand. In contrast to the sphinxes in Egypt, Mesopotamia, and Greece, of which the traditions largely have been lost due to the discontinuity of the civilization, the traditions related to the "Asian sphinxes" are very much alive today. The earliest artistic depictions of "sphinxes" from the South Asian subcontinent are to some extent influenced by Hellenistic art and writings. These hail from the period when Buddhist art underwent a phase of Hellenistic influence. Numerous sphinxes can be seen on the gateways of Bharhut stupa, dating to the 1st Century B.C. In South India, the "sphinx" is known as purushamriga (Sanskrit) or purushamirugam (Tamil), meaning "human-beast". It is found depicted in sculptural art in temples and palaces where it serves an apotropaic purpose, just as the "sphinxes" in other parts of the ancient world. It is said by the tradition, to take away the sins of the devotees when they enter a temple and to ward off evil in general. It is therefore often found in a strategic position on the gopuram or temple gateway, or near the entrance of the Sanctum Sanctorum. The purushamriga plays a significant role in daily as well as yearly ritual of South Indian Shaiva temples. In the shodhasha-upakaara (or sixteen honors) ritual, performed between one and six times at significant sacred moments through the day, it decorates one of the lamps of the diparadhana or lamp ceremony. And in several temples the purushamriga is also one of the vahana or vehicles of the deity during the processions of the Brahmotsava or festival. In Kanya Kumari district, in the southernmost tip of the Indian subcontinent, during the night of Shiva Ratri, devotees run 75 kilometres while visiting and worshiping at twelve Shiva temples. This Shiva Ottam (or Run for Shiva) is performed in commemoration of the story of the race between the Sphinx and Bhima, one of the heroes of the epic Mahabharata. The Indian conception of a sphinx that comes closest to the classic Greek idea is in the concept of the Sharabha, a mythical creature, part lion, part man and part bird, and the form of Sharabha that god Shiva took on to counter Narasimha's violence. In Sri Lanka and India, the sphinx is known as narasimha or man-lion. As a sphinx, it has the body of a lion and the head of a human being, and is not to be confused with Narasimha, the fourth reincarnation of the deity Vishnu; this avatar or incarnation is depicted with a human body and the head of a lion. The "sphinx" narasimha is part of the Buddhist tradition and functions as a guardian of the northern direction and also was depicted on banners. In Burma, the sphinx is known as manussiha (manuthiha). It is depicted on the corners of Buddhist stupas, and its legends tell how it was created by Buddhist monks to protect a new-born royal baby from being devoured by ogresses. Nora Nair, Norasingh and Thep Norasingh are three of the names under which the "sphinx" is known in Thailand. They are depicted as upright walking beings with the lower body of a lion or deer, and the upper body of a human. Often they are found as female-male pairs. Here, too, the sphinx serves a protective function. It also is enumerated among the mythological creatures that inhabit the ranges of the sacred mountain Himapan. The revived Mannerist sphinx of the late 15th century is sometimes thought of as the "French sphinx". Her coiffed head is erect and she has the breasts of a young woman. Often she wears ear drops and pearls as ornaments. Her body is naturalistically rendered as a recumbent lioness. Such sphinxes were revived when the grottesche or "grotesque" decorations of the unearthed Domus Aurea of Nero were brought to light in late 15th-century Rome, and she was incorporated into the classical vocabulary of arabesque designs that spread throughout Europe in engravings during the 16th and 17th centuries. Sphinxes were included in the decoration of the loggia of the Vatican Palace by the workshop of Raphael (1515–20), which updated the vocabulary of the Roman grottesche. The first appearances of sphinxes in French art are in the School of Fontainebleau in the 1520s and 1530s and she continues into the Late Baroque style of the French Régence (1715–1723). From France, she spread throughout Europe, becoming a regular feature of the outdoors decorative sculpture of 18th-century palace gardens, as in the Upper Belvedere Palace in Vienna, Sanssouci Park in Potsdam, La Granja in Spain, Branicki Palace in Białystok, or the late Rococo examples in the grounds of the Portuguese Queluz National Palace (of perhaps the 1760s), with ruffs and clothed chests ending with a little cape. Sphinxes are a feature of the neoclassical interior decorations of Robert Adam and his followers, returning closer to the undressed style of the grottesche. They had an equal appeal to artists and designers of the Romanticism and subsequent Symbolism movements in the 19th century. Most of these sphinxes alluded to the Greek sphinx and the myth of Oedipus, rather than the Egyptian, although they may not have wings. The sphinx image also has been adopted into Masonic architecture. Among the Egyptians, sphinxes were placed at the entrance of the temples to guard their mysteries, by warning those who penetrated within that they should conceal a knowledge of them from the uninitiated. Champollion said that the sphinx became successively the symbol of each of the gods. The placement of the sphinxes expressed the idea that all the gods were hidden from the people, and that the knowledge of them, guarded in the sanctuaries, was revealed to initiates only. As a Masonic emblem, the sphinx has been adopted in its Egyptian character as a symbol of mystery, and as such often is found as a decoration sculptured in front of Masonic temples, or engraved at the head of Masonic documents. It cannot, however, be properly called an ancient, recognized symbol of the order. Its introduction has been of comparatively recent date, and rather as a symbolic decoration than as a symbol of any particular dogma. The 32,000-year-old Aurignacian Löwenfrau goddess is the oldest known anthropomorphic statue. Previously known as the Lion-man, she has a human female body and a lioness head. Not all human-headed animals of antiquity are sphinxes. In ancient Assyria, for example, bas-reliefs of shedu bulls with the crowned bearded heads of kings guarded the entrances of temples. 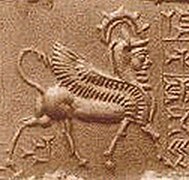 The Iranian Gopat or Gopaitioshah is another creature that is similar to the Sphinx, being a winged bull/lion with human face. The Gopat have been represented in ancient art of Iran since late second millennium BC, and was a common symbol for dominant royal power in ancient Iran. Gopats were common motifs in the art of Elamite period, Luristan, North and North West region of Iran in Iron Age, and Achaemenid art, and can be find in texts such as the Bundahishn, the Dadestan-i Denig, the Menog-i Khrad, as well as in collections of tales, such as the Matikan-e yusht faryan and in its Islamic replication, the Marzubannama. 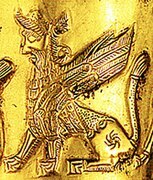 The Manticore (Early Middle Persian: Mardyakhor or Martikhwar, means: Man-eater) is an Iranian legendary hybrid creature and another similar creature to the sphinx. Many Greek mythological creatures who are archaic survivals of previous mythologies with respect to the classical Olympian mythology, like the centaurs, are similar to the Sphinx. Narasimha ("man-lion") is described as an incarnation (Avatar) of Vishnu within the Puranic texts of Hinduism who takes the form of half-man/half-Asiatic lion, having a human torso and lower body, but with a lion-like face and claws. Achaemenid sphinx from Halicarnassus, capital of Caria, 355 BC. Found in Bodrum Castle, but possibly from the Mausoleum at Halicarnassus. 3000-year-old sphinxes were imported from Egypt to embellish public spaces in Saint Petersburg and other European capitals. Marble sphinx on a cavetto capital, Attic, c. 580–575 B.C. 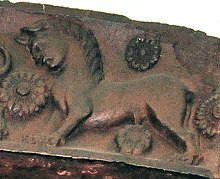 Picture of an Iranian Elamite Gopat on a seal, currently in the National Museum of Iran. An Iranian Luristan Bronze in the form of a Gopat, currently in the Cleveland Museum of Art. Picture of a Gopat on a golden rython from Amarlou, Iran, currently in the National Museum of Iran. Wikimedia Commons has media related to Sphinxes. Manticore, Persian monster with a lion's body and a humanoid head. Haetae to compare with similar lion-like statues in Korea. ^ "Dr. J's Lecture on Oedipus and the Sphinx". People.hsc.edu. Retrieved 2014-05-15. ^ Kallich, Martin. "Oepidus and the Sphinx." Oepidus: Myth and Drama. N.p. : Western, 1968. N. pag. Print. ^ Stewart, Desmond. Pyramids and the Sphinx. [S.l. ]: Newsweek, U.S., 72. Print. ^ "Is The Sphinx 12 000 Years Old?". Dailyavocado.net. 2011-01-27. Archived from the original on 24 June 2011. Retrieved 2014-05-15. CS1 maint: Unfit url (link) Archived. ^ Nicholas Birch in Istanbul (2008-04-23). "Birch, N., 7000 Years Older Than Stonehenge: The Site that Stunned Archaeologists, The Guardian, April 2008". Guardian. Retrieved 2014-05-15. ^ Regier, Willis Goth. Book of the Sphinx (Lincoln: University of Nebraska Press, 2004), 54, 59, 177. ^ Entry σφίγγω at LSJ. ^ Note that the γ takes on a 'ng' sound in front of both γ and ξ. ^ Bauer, S. Wise (2007). The History Of The Ancient World. New York: W. W. Norton & Company, Inc. pp. 110–112. ISBN 0-393-05974-X. ^ Edmunds, Lowell (1981). The Sphinx in the Oedipus Legend. Königstein im Taunus: Hain. ISBN 3-445-02184-8. ^ Julien d'Huy (2012). L'Aquitaine sur la route d'Oedipe? La Sphinge comme motif préhistorique. Bulletin de la SERPE, 61: 15-21. ^ Regier, Book of the Sphinx, chapter 4. ^ Maier, Michael (1617). Atalanta Fugiens. trans. Peter Branwin. Johann Theodor de Bry. ^ a b "Sphinxes of all sorts occur on the Bharhut gateways" Kosambi, Damodar Dharmanand (2002). Combined Methods in Indology and Other Writings. Oxford University Press. p. 459. ISBN 9780195642391. ^ Deekshitar, Raja. "Discovering the Anthropomorphic Lion in Indian Art." in Marg. A Magazine of the Arts. 55/4, 2004, p.34-41; Sphinx of India. ^ Demisch, Heinz (1977). Die Sphinx. Geschichte ihrer Darstellung von den Anfangen bis zur Gegenwart. Stuttgart. ^ "Thep Norasri". Himmapan.com. Retrieved 2014-05-15. ^ Royal Museums of Fine Arts of Belgium (2017). "Caresses". Google Arts and Culture. ^ "Dadestan-i Denig, Question 90, Paragraph 4". ^ "Menog-i Khrad, Chapter 62". ^ Taheri, Sadreddin (2013). "Gopat and Shirdal in the Near East". Tehran: Honarhay-e Ziba Journal, Vol. 17, No. 4. Taheri, Sadreddin (2013). "Gopat (Sphinx) and Shirdal (Gryphon) in the Ancient Middle East". Tehran: Honarhay-e Ziba Journal, Vol. 17, No. 4. Kallich, Martin. "Oedipus and the Sphinx." Oedipus: Myth and Drama. N.p. : Western, 1968. N. pag. Print.